On this third birthday of WebOS Internals' homebrew app Preware, we found it fitting that we give you a Preware-related tip today. Preware is a amazing app that will allow you to search for and install patches, apps, themes and more, and when combined with App Tuckerbox you can access the official webOS App Catalog to expand it even further. Even though the app catalog may only be a fraction the size of its competitors, there is still a lot of junk in there that will diminish your browsing experience. Luckily, Preware has a "blacklist" functionality that will prevent those packages from showing up that can be set based on the title, maintainer (developer), package id, app description or category of the package. Swipe down from the top-left to view the Application dropdown menu and select "Preferences"
"SEARCH FOR" determines the value that you want to search for. 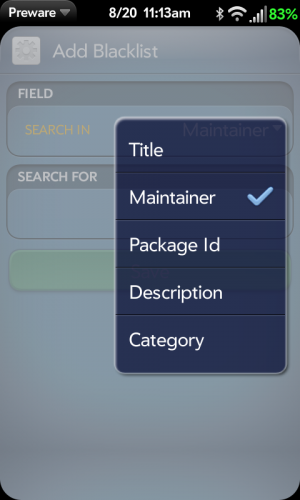 For example, to remove any app by "Applible LLC", you can choose Field = Maintainer and Search For = "Appible", or you choose to search "Package Id" for "com.appible"
When done, tap the green "Save" button.